Based in Bromley, South East London, we provide first class cleaning and flat maintenance services to managing agents, property development agencies, residential companies, housing associations and commercial clients across London, Kent and the South East. Established in 1984, we have extensive and unrivalled experience and expertise in residential and commercial cleaning and grounds management and we strongly uphold an ethos of delivering high quality of service and ensuring that projects are efficiently and promptly completed. During our years in the property maintenance industry, we have developed close relationships with a considerable number of our existing UK clients. Our customers experience the best customer care approach, due to a strong culture of team spirit, which cascades down to all our members of staff. Our experience proves that a policy of good business relations results in self-discipline, staff stability and delivery of our working promises. One of the reasons why we are at the top of our industry is the dedication, experience and skills of our friendly cleaners and flat maintenance specialists. Our staff are our best asset and our excellent record of renewing and winning new cleaning and maintenance contracts is down to their hard work and ability to continually achieve and even exceed our high standards. To ensure that our high standards are continually met, we display a maintenance schedule in each communal hallway and commercial property. This provides the dates of our visits and als o provides a comments section for residents and clients to bring to our attention any particular maintenance issues. Inspections are also carried out regularly to ensure we maintain and improve upon our already high standards. For your peace of mind, we also operate a strict health and safety policy and are fully insured for additional protection. We are also Safe Contractor approved, as well as members of the British Institute of Cleaning Service, the Ladders Free Water Fed Pole System Organisation, the National Federation of Master Window and General Cleaners and the International Powered Access Federation. 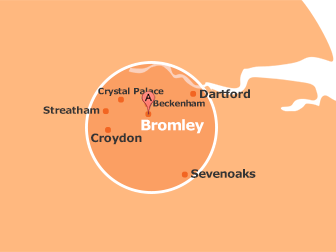 From our central office premises in the London borough of Bromley, we work throughout Kent, London and the South East, providing superb cleaning, Reach & Wash window cleaning, flat and grounds maintenance, roofing and painting and decorating services to commercial and residential clients. We have an extensive portfolio of completed contract cleaning and property maintenance projects for customers in Gravesend, Maidstone, Orpington, Dartford, Canterbury, Tunbridge Wells, Bexleyheath, Tonbridge, West Kingsdown, Beckenham, Medway, Sevenoaks, Bromley and London. If you require any more information about the wide ranging property maintenance services we provide, please get in touch with us today. A member of our friendly and experienced team will field your questions, discuss individual maintenance requirements and then arrange your free property survey and no obligation quotation at your convenience.